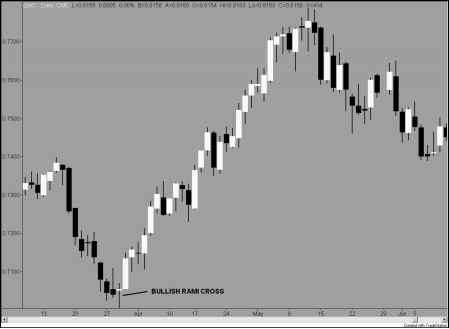 To get an idea of how you can trade to turn a profit with the bullish harami cross, look at Figure 7-8. 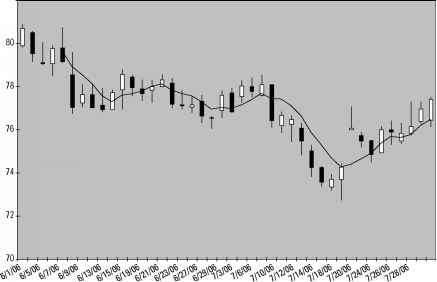 That's a chart of the Australian dollar futures, with a bullish harami cross that successfully signals a trend reversal. I actually traded this pattern, and the results were strong. A bullish harami cross pattern. A bullish harami cross on an Australian dollar futures chart. When this pattern reared its head, I was looking for an entry point for trading long on the Australian dollar futures contract. I had been monitoring it for a while, and I bought near the close of the bullish harami cross's signal day. This pattern adheres to the rules for a buy signal because it's at the bottom of a downtrend, and the doji's open and close fall within the setup day's open and close. Soon after I got in, I was happily rewarded with an uptrend that lasted for several weeks, and you can enjoy the same kind of results if you spot the bullish harami cross in a similar environment.